iPhone 4 gets what most Nokias had for a long time: a front facing camera and video calls with what Apple calls "Facetime". Nobody ever used it on the Nokias, the jury is out for the iPhone. Google Navigations comes to Europe: Austria, Belgium, Denmark, France, Germany, Italy, the Netherlands, Portugal, Spain, and Switzerland. For Android devices 1.6 and higher. Update your Google Maps application to get it. Looks like the carriers killed it ... Free video calls on your data plan was probably asking too much. I also find it odd they did not integrate with iChat. iChat integration would have killed the option to make it a industry standard and available on other systems as well, would it not? iChat speaks XMPP. That would have been a good start for presence and chat ... Apple could have built on top of that. 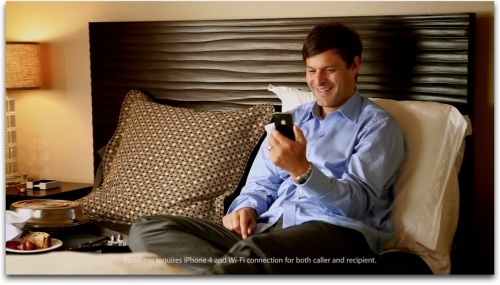 The image above seems to show a man in a hotel room, probably talking to his wife and kids using FaceTime. So, they probably have Wi-Fi at home and he'll have Wi-Fi in the hotel. All good, right? The reality is that most Wi-Fi networks in hotels offer abysmal performance, so it's not the greatest scenario to illustrate the feature. I believe we'll see a iChat integration in one of the next major iOS releases. Comment "we just wanted to do it right"
Which is equal to: Didn't get it done until now! :) Or in Hardware terms: Wanted to rip a few dollars out of you with the new feature. But anyway, this seems to be the first iphone I want to have. Darren, that makes (some) sense. The reality in Germany however is that hotels charge 15 a night for WLAN access, so people have resorted to using 3G USB sticks in their notebooks. I believe Facetime would work very well over 3G, but Apple is being nice to carriers. It will change (iPhone 4 only and WiFi) – or it will be a footnote to the history of video telephony! I tested Google Navigation on my drive home (MA>GG) yesterday using my HTC Desire. It drained the battery (initial charge 70%) on a 40 minutes drive to 14%. This is rather useless without an in-car charger/dock. Yes, you need the car dock. Display and GPS use way too much energy. Let's be honest, it blows away Notes, Outlook, Google Calendar, GroupWise, and just about everything else except iCal on the Mac. It is just that damn good. How do they manage Facetime? Does iPhone #1 send some credentials (e.g. phone number or another unique id) over the air to iPhone #2 without central instance and then the video connection is initiated as P2P? Or are there any central 'cloud' services working on establishing this connection. Currently only my telco has my call history, with the second case other operators would have that too. I used it... once - and found out it technically works but doesn't really add any value... not because of Nokia's implementation of it, but because the concept itself is not really that valuable (at least not on the go, where I usually use my cellphone).